leather and cigar flavors, powdered cocktails, cocktails with suspended elements, cocktail gums, paper cocktails, solid cocktails, cocktail marshmallows, flavored ice spheres, frozen ‘nitro’ cocktails, cocktail popsicles, cocktail glasses filled with cotton candy and much more!! The creativity and imagination of these mixologists is endless! Mixologists who work at molecular gastronomy restaurants are fortunate to have easy access to the expensive equipment used by the chef. But a lot can be done with reasonably priced tools in almost any bar and at home if you have patience and a little extra time to dedicate to the cocktail preparation. Molecular mixology equipment ranges from simple blowtorches to vacuum chambers, ISI Whips, sous vide machines, cotton candy makers, liquid nitrogen, rotary evaporators and dehydrators. You can easily get started with our Molecular Mixology Kit. 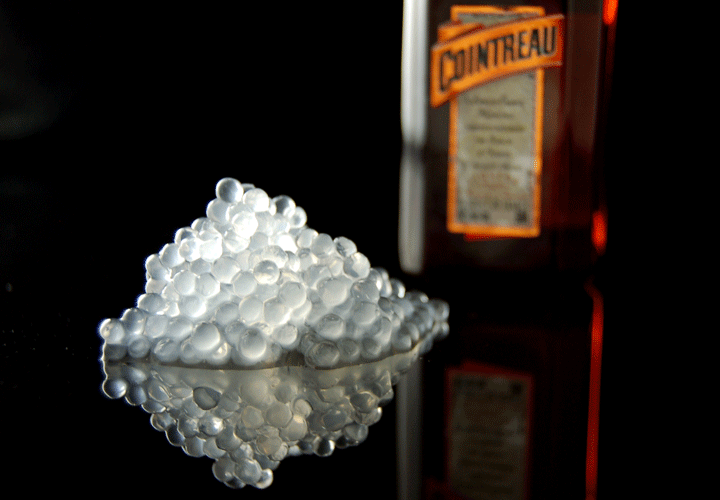 Molecular cocktails were first created by molecular gastronomy chefs such as Ferran Adria and Heston Blumenthal but the trend was quickly adopted and taken to the next level by pioneer mixologists such as Tony Conigliaro, who has collaborated with Heston Blumenthal, Eben Klemm, Eben Freeman and Angel Chocano. The spherification technique created by molecular gastronomy Chef Ferran Adria is also used in molecular mixology. Basic spherification, for example, is used to create caviar of Cointreau that can be added to champagne, cosmopolitans, margaritas, sidecar and many other traditional cocktails to make them more interesting. Molecular gastronomy Chef Jose Andres serves at Minibar Carbonated Mojito Spheres made using Reverse Spherification and carbonated in an ISI Whip charged with CO2. Bar Nineteen 12 in Beverly Hills serves a flight of five jelly shots: a half-sphere blueberry martini with a fresh blueberry suspended in the center, a slice of jellified layers of Grand Marnier, Kahlúa and Baileys to create an edible B-52, a pear martini made with pear purée, a mojito shot in the shape of a diamond and a round bubble gum martini. The fancy jello shots are served on a glass box filled with ice and lighted from inside. They also serve other jellied cocktails like campari and orange juice, gin and tonic, champagne with candied orange peel, vanilla bean Prosecco, Manhattan and tequila sunrise. 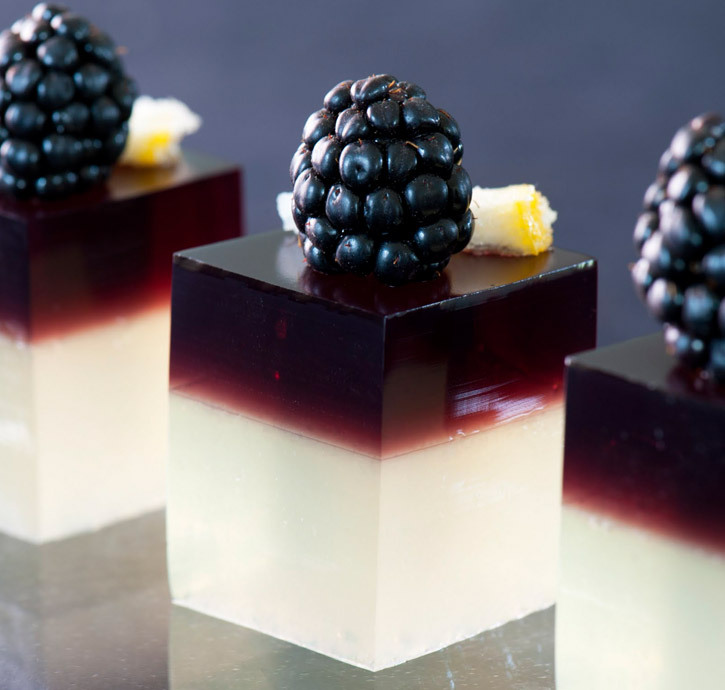 At Craft restaurant in Los Angeles, pastry chef Catherine Schimenti serves jelly cubes of Prosecco, simple syrup and vanilla bean seeds. Molecular mixologist Eben Freeman, of Tailor restaurant in New York City, is a pioneer in creating molecular cocktails. Freeman makes a trio of edible cocktails that is delicious! Cuba Libre Gelatin Square, Ramos Gin Fizz Marshmallow and White Russian Breakfast Cereal. The Cuba Libre Gelatin Square is made by mixing rum and coke with gelatin. Once set, the gelatin is cut into cubes and served on a lime chip. The lime chip is made by freezing a whole lime, it is then cut with a meat slicer into very thin slices which are then dipped in syrup and dried in a dehydrator until crispy. Learn more about making Cocktail Gels. Molecular mixologists are using the incredible Hot Infusion Siphon to make hot cocktails at the table. Hot infused drinks are becoming a very creative alternative to experiment unique combinations of flavors and with this device your guests will be impressed with the most interesting infusion process they have ever seen. Hot cocktails are perfect for cold winter nights. 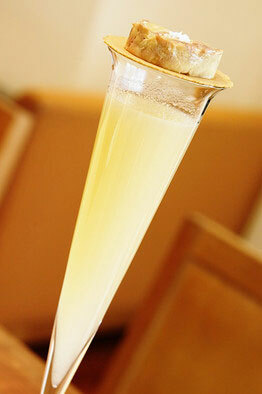 Check out our delicious Hot Infusion Siphon Cocktail – Lavender, Galangal, Jasmine. With a base of gin, this concoction is infused at the table with jasmine tea, lavender, galangal (ginger family), lemongrass and lemon peel. Watch the video below and see the Hot Infusion Siphon in action! The Ramos Gin Fizz Marshmallow of Freeman's edible cocktails trio (photo below) is made with a traditional Ramos Gin Fizz recipe (gin, lemon juice, lime juice, egg white, sugar, cream, orange flower water, and soda water) plus some additional sugar and gelatin, then whipped and baked to make the marshmallows. The marshmallow squares are then tossed in juniper sugar (juniper berries ground in a spice grinder). 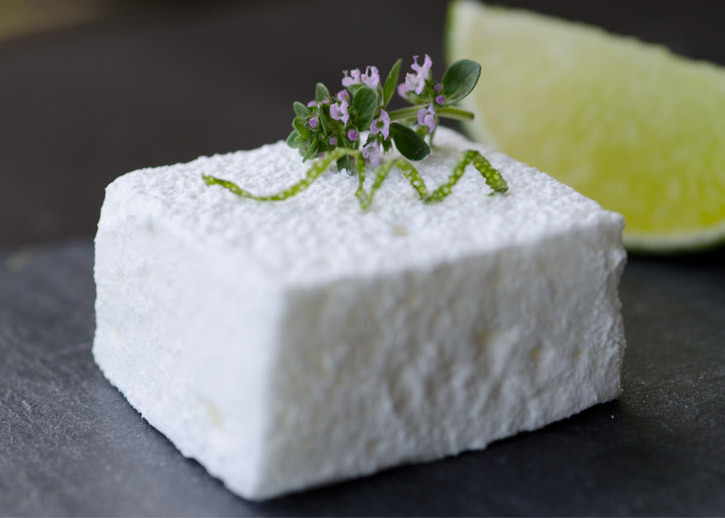 Below is our Pisco Sour Cocktail Marshmallow. 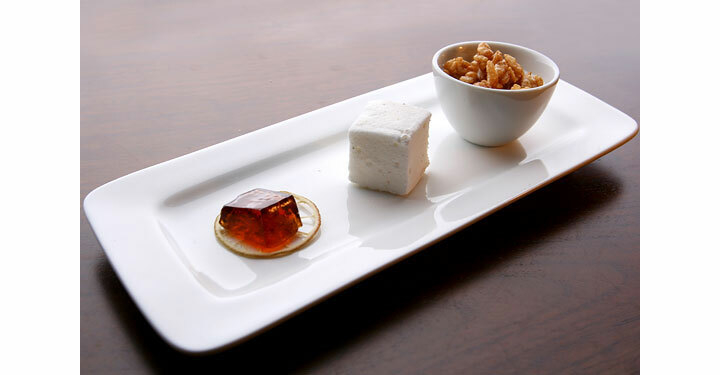 The White Russian Breakfast Cereal of Freeman's edible cocktails trio (photo above) is made by tossing Rice Krispies in Kahlúa liquor, then dried in a dehydrator. This process is done twice to add more Kahlúa flavor to the cereal. 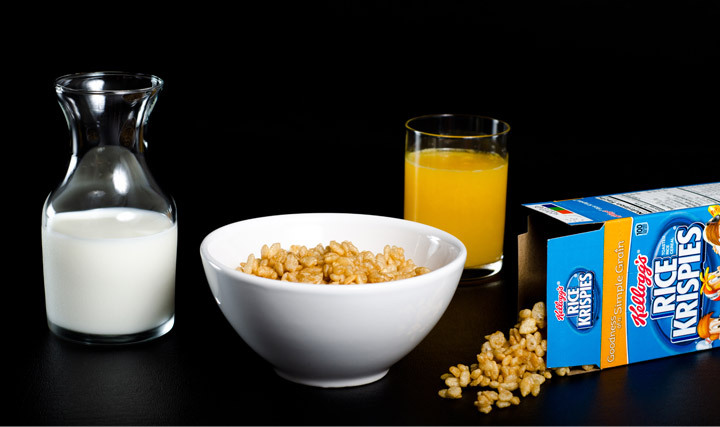 The Kahlúa krispies are served in a bowl and chilled “vodka milk” is added. The vodka milk is a mixture of half and half with some sugar and, of course, vodka. 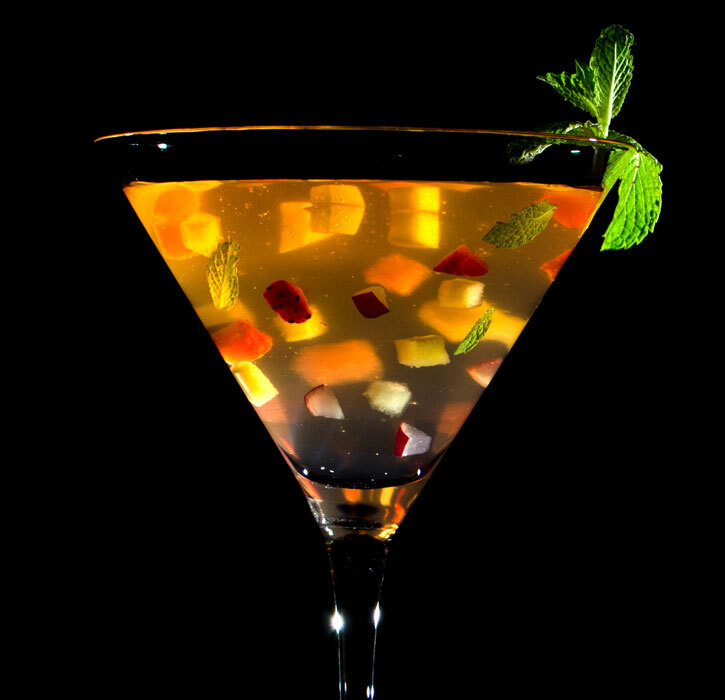 Other examples of molecular cocktails that fall in this category are sugar cubes infused with spirits and compressed fruits infused with alcohol such as watermelon with soju topped with sesame seeds and cantaloupe compressed with Champagne topped with Prosciutto. Molecular mixologist Freeman has also experimented with “paper cocktails” such as a thin, crispy sheet of quince sour made with whiskey, quince and lemon. Above is our Aperol Cocktail Paper and Gel. Molecular mixologist Eben Freeman also serves powdered cocktails. He makes dehydrated rum and coke by mixing cola-flavored popping sugar with rum powder. I guess this has no alcohol content so maybe we should call it powdered virgin cocktail. Molecular gastronomy chef Heston Blumenthal serves his famous whiskey gums at his restaurant The Fat Duck. 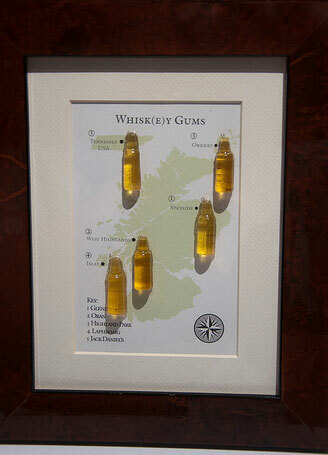 The whiskey gums have the shape of a bottle and are served on a photo frame with the map of Britain (photo above). 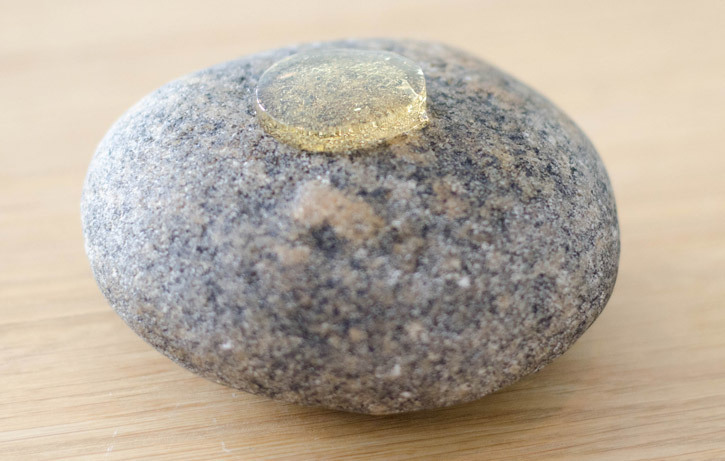 Each whiskey gum is made from a different whiskey and it is placed on the map indicating the region where it was made. He also has a wine gums version. Molecular mixologist Freeman has also jellied gin and tonic and has served it on lime chips and sprinkled with "tonic" powder. The “tonic” powder, which adds fizz to the edible cocktail, is a mixture of baking soda, citric acid and powdered sugar. 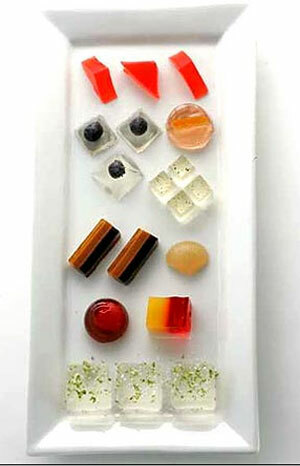 Molecular gastronomy Chef Michael Han serves gin and tonic gums in his Singapore restaurant. The gum is served on a cold stone and the diners are told to place the gum on the tongue and let it melt in the mouth. Bar Nineteen 12 also converts cocktails into ice pops. Colorful martini Popsicles of various flavors including apple, watermelon and sour cherry or like these Limoncello and Raspberry Whiskey Sour Popsicles published in Chilled Magazine. Molecular gastronomy Chef José Andrés serves “nitro caipirinha” at Bar Centro in Los Angeles. The “nitro caipirinha” is made at the table by freezing a delicious caipirinha using liquid nitrogen. The end result is caipirinha slush with very high alcoholic content. Pioneered by chef Homaro Cantu, this technique is used by molecular mixologists to offer guests a flavor-tripping experience with cocktails using a curious little berry called a miracle berry or miracle fruit. The flavor tripping cocktails and dishes at his modernist restaurant iNG are incredible. A "gin and tonic on the rock" is served in an Erlenmeyer flask with lime juice ice on the outside as you can see in the picture below. Under the influence of a miracle berry, the cocktail changes into a Sloe Gin Screw. At iNG, a Hot Toddy morphs into an alcoholic Arnold Palmer and a Margarita into a Tequila Sunrise. Learn more about Flavor-Tripping here. Molecular gastronomy chefs have transformed classic cocktail into an edible cocktail by hollowing a fruit, filling it with a cocktail gel and garnishing it with bitters pudding, micro herbs or citrus zest. Mixologist Jamie Boudreau serves a cocktail in cored cherry tomatoes filled with a gel of gin, Tabasco, Worcestershire sauce and salt. Another molecular mixology technique developed by Chef Ferran Adria is to suspend solid elements in liquid to create visually stunning cocktails and drinks. Xanthan Gum is used to thicken the liquid to maintain elements in suspension in a drink without sinking. One of his creations is White Sangria in Suspension with herbs, fruit and spherical caviar suspended in the sangria mix. 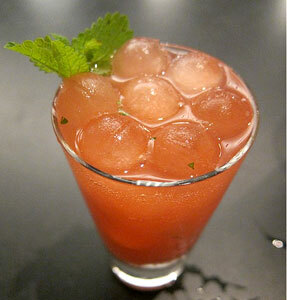 See recipe of our version of Sangria in Suspension here. Tony Conigliaro, co-founder of 69 Colebrooke Row in London, created the Don Julio Kaffir Margarita which is served in a frozen kaffir lime that has been cut on one end and hollowed to be used as a shot glass. 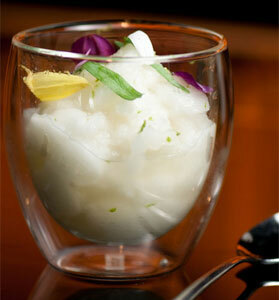 The tequila is infused with kaffir lime leaves and zest using the low temperature infusion with sous vide method. 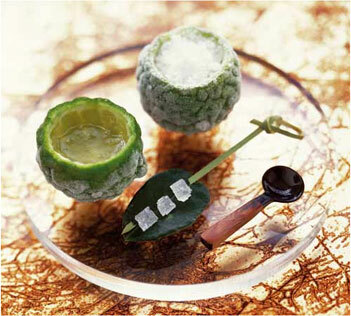 The margarita shot is accompanied by another frozen kaffir lime filled with sea salt snow and oak-smoked rock salt pieces placed on a kaffir leaf coated with gelatin with kaffir essence. Lick the salt off the lime leaf, drink the margarita, followed by the salt snow. Eddie Perez, the Foundry mixologist in Hollywood, created a cocktail served in a spoon with granité of pear vodka mixed with finely grated dehydrated maraschino cherries, topped with pearls of Champagne gelée and fresh Champagne grapes that have been peeled and marinated in Drambuie, sprinkled with lemon and lime zest. 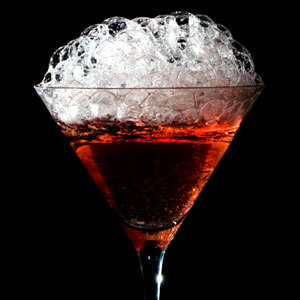 Foams, airs and bubbles are a great way of adding a molecular touch to any cocktail. In the Cranberry Bubbles Cosmo, a classic cosmopolitan is topped with cranberry bubbles made using the “bubbles with air pump” technique. An elderflower foam, made with St. Germain liquor and chardonnay foamed in an ISI Whip, can add a nice touch to a glass of Champagne. Cotton candy is another fun way to serve a cocktail in style. The glass is generously filled with cotton candy, the cocktail is served in a shaker and strained over the cotton candy making it disappear as it dissolves. 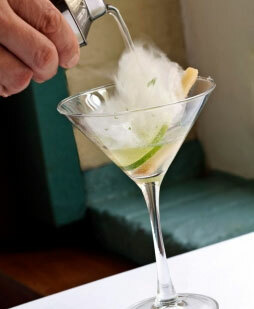 Molecular gastronomy Chef Jose Andres serves a “Magic Mojito” with cotton candy at The Bazaar in Los Angeles. Some molecular mixologists are experimenting with cocktail flavored cotton candy. Layered cocktails do not create new textures or flavors but make a beautiful presentation. Layered cocktails were made before the term molecular mixology existed but this technique is still used today by molecular mixologists so I decided to include it. To create layered cocktails, each ingredient is carefully poured into a glass or carafe starting with the densest liquid first and progressing to the least dense. The Cocktailmaster device can be used to make a 7 Layer Hurricane with multiple juices and types of rum. 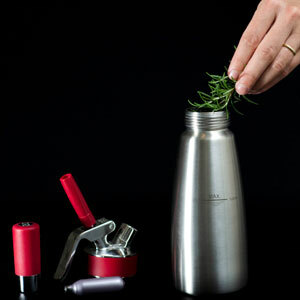 Get your Cocktailmaster from our store and create your next signature cocktail or dish. Infusing alcohols with other flavorful ingredients is a great technique to enhance flavors, create unique flavor profiles, build up the complexity of a drink and surprise your diners. You can infuse flavors into alcohol using flavorful ingredients like herbs, spices, seeds, fruits and others. There are a few infusion methods that are particularly good for molecular mixology because they are fast and can be done in cold or low temperature to maintain the alcohol content of the spirit: high pressure rapid infusion with the ISI Whip, vacuum chamber infusion and low temperature infusion Sous Vide. (read more about infusion techniques). Infuse spirits with cocoa nibs, coffee, nuts, fresh herbs or anything you want to experiment with. 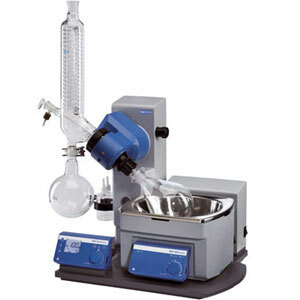 Lucky molecular mixologists who can afford purchasing a Rotary Evaporator, which costs over $6000, use this equipment to extract essential oils of a solid ingredient by boiling in a vacuum at low temperature without damaging the fresh aroma compounds. The essential oils can then be mixed with other ingredients to be used in a cocktail. This method has been used to extract soil and leather aromas for example. 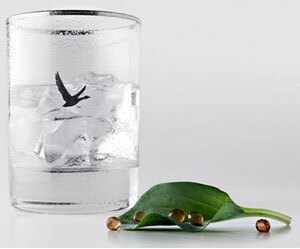 - Grey Goose l'Originale - oyster leaf – caviar: The pure taste of Grey Goose L'Original matches perfectly with oysters. Instead of using oysters for this cocktail they used oyster leaf, a special plant with a slightly salty taste. The resemblance with the taste of oyster is striking, therefore this plant is sometimes called the vegetarian oyster. The tiny leaves of the plant are decorated with caviar, red wine vinegar and shallot, a reference to the traditional preparation of oysters in France. - Grey Goose le Citron - Camembert – litchi: It’s old news that cheeses can be matched to perfection with various fruits. The savory nature of the cheese is underscored when combined with the sweet, fresh taste of fruit. 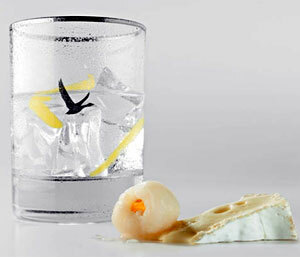 The aroma analysis showed that Grey Goose Le Citron can be perfectly combined with camembert, the world famous white cheese from Normandy, traditionally made from raw, unpasteurized milk. Add also lychee for a surprising, yet delicious treat. 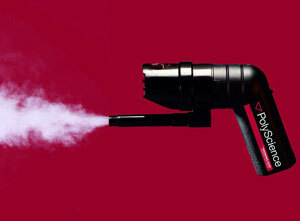 Using a device like the Smoking Gun, the Super-Aladin smoker or the Volcano vaporizer, molecular mixologists can quickly add smoke and other aromas to cocktails without using heat. These devices have been used to create drinks such as Cigar-smoke Infused Manhattan, Smoked Beer, Applewood Smoked Bloody Mary, Smoked Bourbon and Bacon Vodka Bloody Mary. There is a trend in molecular mixology to pair a food bite with a cocktail. Chef Cathal Armstrong and mixologist Todd Thrasher created an eat-and-drink cocktail for their PX Lounge bar consisting of sauternes, poached pear and Licor 43 (citrus and vanilla flavored Spanish liquor with 43 ingredients) topped with foie gras on a crispy wafer. The cocktail is called Pear of Desire and it is served in a beautiful small flute glass.